The 2019 Volkswagen Golf is the perfect combination of the convenience of a sedan and space of a crossover. 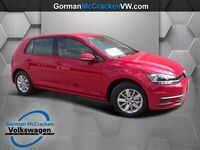 This fan-favorite from Gorman McCracken Volkswagen offers drivers the best of both worlds in a small hatchback package. Available in two athletic trim levels – S and SE – while wearing a budget-friendly price tag of $21,845, the 2019 VW Golf from Gorman McCracken Volkswagen is the complete package. Drivers can customize their Golf to reflect their personality with one the seven showstopping exterior color options - Silk Blue Metallic, Night Blue Metallic, Deep Black Pearl, Platinum Gray Metallic, Pure White, Tornado Red, and Tungsten Silver Metallic. Continue reading this 2019 Volkswagen Golf vs 2019 Honda Fit comparison to see just how well the Golf stacks up against the competition. What are the differences between the 2019 VW Golf and 2019 Honda Fit? Style and performance come together perfectly in the 2019 Volkswagen Golf. This Volkswagen hatchback generates 147 horsepower and 184 pound-foot of torque thanks to its 1.4-liter turbocharged engine. The 2019 Golf comes standard with a 6-speed manual transmission while offering drivers an available 8-speed automatic transmission with Tiptronic® and Sport mode. Drivers can shift the Golf into Sport mode to up the fun and athletic feel behind the wheel or they can shift over to Tiptronic® mode to take more control over the way their Golf shifts and performs. The competing 2019 Honda Fit is powered by a 1.5-liter 4-cylinder engine paired with a Continuously Variable Transmission. This combination in the Fit generates 128 horsepower and 113 pound-foot of torque. With 22.8 cubic feet of cargo space in the rear of the 2019 VW Golf, passengers and cargo ride comfortably. When you need a little more room carrying cargo in the trunk of the Golf, the 60/40-split rear seatback can be folded down to expand the rear cargo area to a spacious 52.7 cubic feet of maximum cargo space. The competing 2019 Honda Fit offers drivers 16.6 cubic feet of space when all five seats are engaged and 52.7 cubic feet when the rear seatback is folded down. The 2019 VW Golf keeps drivers and passengers feeling safe throughout every drive with the suite of available Driver Assistance features. Technologies like Lane Assist, Adaptive Cruise Control, Blind Spot Monitor, Front Assist, and more are available to keep you feeling confident behind the wheel of the 2019 Volkswagen Golf.